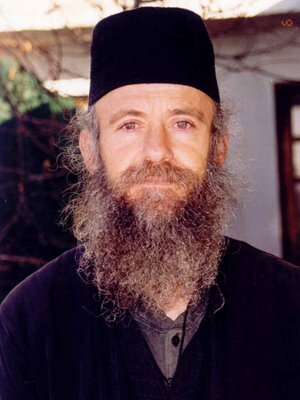 Monk Joseph, known in the world as Christos Bairaktaris, is 49 years old. He comes from the village of Agios Vasilios in Corinth, though is considered by the Greek air force to be a part of their own family. All pilots of the Phantom, Corsair and F-16 aircraft's know him, who daily embark in the dangerous struggle to preserve the dignity of Greece and preserve the Greek identity of the Aegean Sea. Father Joseph has been a monk on Mount Athos since the early 1980's. 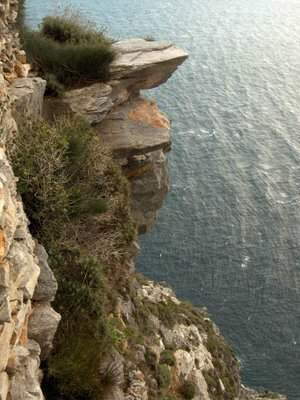 Since 1989 he has withdrawn by himself to live as an ascetic on the rocks of Cape Akrathos, over a cliff 300 meters deep. Alone with God, he reads, does manual work and saves his soul. "He is a saintly man, a biblical personality, who, that if anyone comes to meet him, opens a window to a world of goodness and love," says George Vazouras, a pilot who visits him often, to Press Time. 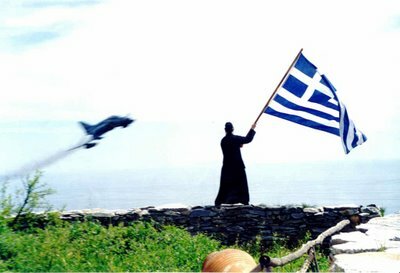 Father Joseph, a hermit on Mount Athos, monitors the air battles of the Aegean and blesses the fighter pilots. 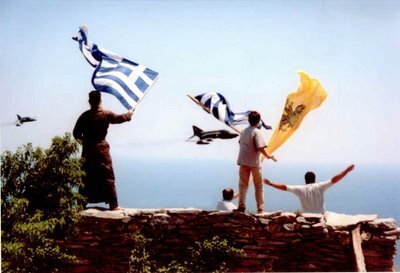 Since 1990 nearly all Greek pilots after each engagement with the Turks fly over Mount Athos to get the blessing of the venerable elder. "Every day, when I hear the sound of airplanes, I dash from my cell. I go out and wave the Greek flag. I weep with emotion, as these young kids always, following any mission in the Aegean, come to greet me that I may give them my blessing." On one occasion, four Turkish F-16's pierced through the clouds and poured out over the Aegean. When they entered Greek air apace, they broke off into pairs. One pair turned to the right towards Thaso and Samothraki, while the other went straight towards the northern Cyclades (Andros, Tinos, Mykonos). The Tactical Air Force in Larissa issued an alarm signal. Four Greek fighter planes, with an experienced captain and a first lieutenant, went off to engage in their daily mission. When the Turkish pilots saw they were being pursued, they united in the northern Aegean near Limnos, Mount Athos and Mytilene. It looked as if these Turkish pilots were not there to "play", since the airplanes with the crescent on the tail were heavily armed. A few minutes later, off the coast of southern Mount Athos, a virtual dogfight began. The Greek pilots, in a masterful way, took the advantage by getting behind them and leading them back to the Turkish coast. They did this at a low altitude right over the sea, with dangerous and tight maneuvers and engines at maximum power. The four Greek F-16's, before returning to their base, then did what all Greek airmen have done in the last thirteen years. They went to get their blessing from their patron! Elder Joseph, from the cliffs of Mount Athos, had watched the dogfight with tears in his eyes. "May you have my blessing! Return now in health and as victors always..." he said to them as he waived his Greek flag over the icy air of the Aegean until the planes were lost in the skyline. "I love them all like my children. I have also met some up close", said the hermit Joseph in a conversation. "Every day, when I hear the sound of airplanes, I dash from my cell. I go out and wave the Greek flag. I weep with emotion, as these young kids always, following any mission in the Aegean, come to greet me that I may give them my blessing. I have watched too many battles. I felt fear and pride. But the feeling I get after each engagement when they pass over my hermitage to greet me is indescribable ... Some of the pilots came here and found me. We embraced, we talked, they opened their hearts. They revealed their problems. I feel that my words are words of God, and will make them even more courageous to defend everything in our Greece." The leader of Aviation, Gen. George Avlonitis, is one of the officers who have met the monk Joseph. And like the others, is impressed by the peaceful nature and wisdom of his words. Pilots from all martial squadrons have sent to the hermit's hermitage prayers, gifts, but above all their love, because they know that after a difficult time in any flight over the Archipelago, their contemporary 'protector' is there on the rocks, in order to bless them and to animate them from the Hermitage of Saint Menas. The Hermitage of Saint Menas is a dependency of the Holy Monastery of Great Lavra. One day the Abbot of Great Lavra, Philip, told Joseph to go to Skyros for the feast of Saint George. He did not want to go. He was too busy with his work and his prayers. 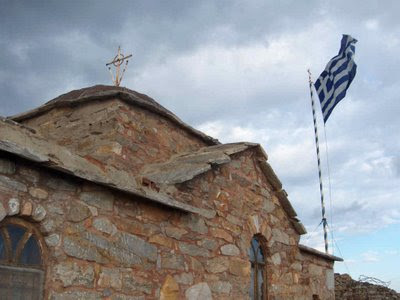 His purpose in going to Skyros was to gather stones for the overhaul of the monastery. Fr. Joseph was obedient. While in Skyros, after the feast, he visited the air base. One of the air force officers approached him and said that he had once seen him as he was flying over the Aegean near the cliffs of Athos as he was talking with two people. He said that he saw him with a man and a woman. Joseph began to laugh. The one whom the pilot thought was a woman was in fact a monk with long hair. He explained this, along with the fact that Mount Athos neither allows women to step in its land nor allows the monks to even think about women. This pilot then began the tradition that whenever he passed by the area of the Hermitage of Saint Menas, that he would fly by and send his greeting. From that time forward there was never a time when this pilot did not do so, but rather he would fly low near the hermitage and send his greeting. In turn, he would receive his blessing. Since other pilots were also flying in the area, they learned of this beautiful relationship between the pilot and the monk, so they began doing the same thing. 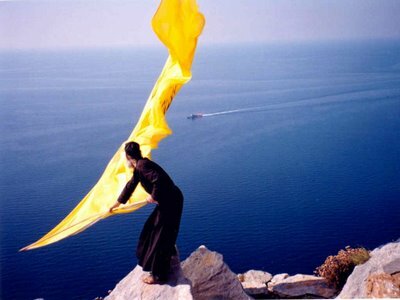 Monk Joseph, in order to make sure that he could be seen and in order to encourage them, decided to get a flag and from a steep and high part of the cliff he waved it as they would fly by doing their cross. Later he got two flags, one Greek and the other Byzantine with the two-headed eagle. This is how the Greek air force established a spiritual relationship with Monk Joseph the Athonite, their patron.